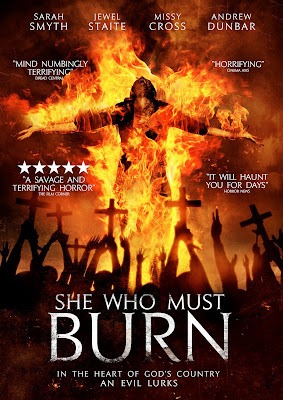 'SHE WHO MUST BURN' comes out from Safecracker Pictures on 15th August 2016 on digital platforms. Canadian auteur director, Larry Kent, brings to the screen a harrowing and terrifying portrait of extremism in the name of religion as fanatical Christian anti-abortion activists terrorise a rural community. In this tense and unnerving horror thriller, Angela, a former nurse at a Planned Parenthood clinic, offers help to women from her home after the local government forced the clinic to shut down. Believing that Angela is coercing women to get abortions, the Baarker family—a group of dangerous and fanatical right-wing Christians - lead by preacher Jeremiah, seek vengeance. They claim that God has ordered them to cleanse the land, and the sin that Angela represents. Along with her police officer boyfriend, Angela decides to stand her ground against the church. Jeremiah is infuriated when Angela gives his wife (Jewel Staite - Firefly, Stargate Atlantis) birth control. When he receives word that a young girl has had an abortion the Baarkers start to hunt the child down. Angela takes her in and vows to protect her. But as the tension between the two sides mounts, the Baakers' zeal turns murderous and the rule of law decays into a brutish mob mentality, leading to a horrifying turn of events. She Who Must Burn from Safecracker Pictures on Vimeo. Directed by the pioneering Canadian auteur Larry Kent who directed classics such as The Bitter Ash (1962), High (1967) and The Hamster Cage (2005). 'SHE WHO MUST BURN' will be released in the UK on digital platforms by Safecracker Pictures on 15th August 2016.